Please complete the form to immediately receive your FREE copy. 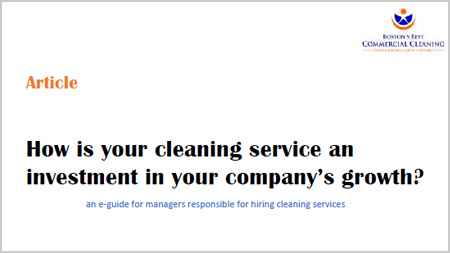 This e-guide will help you and your company save time, save money, achieve your objectives, and eliminate the mistakes that too many companies make when hiring a cleaning service. Over the past few years of representing Boston’s Best Commercial Cleaning in sales meetings and contract discussions with over two hundred companies, we have noticed some very common mistakes that put companies at a disadvantage and that set them up for inevitable failure and frustration. This article will help you determine how a cleaning service can become an investment in your company’s growth strategy.